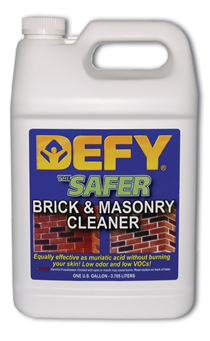 Masonry Saver (Defy) Safer Brick & Masonry Cleaner a safety breakthrough in acid cleaning for commercial and home use. 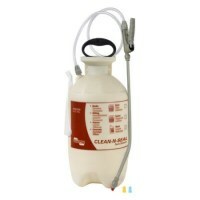 Use for any tough acid cleaning or etching job, where you would normally use Muriatic Acid. The chemical composition of Defy Safer Masonry Cleaner is the same as Muriatic Acid with proprietary additives. The patented chemistry virtually eliminates the dangerous, toxic fumes and potential acid burns normally associated with Muriatic Acid. This formulation of special acids and cleaners will effectively remove rust from concrete, green algae on brick sidewalks, efflorescence brick, along with mildew, smoke and creosote stains. It is a safer alternative to Muriatic acid, cleaning as good – with a special additive to reduce fumes and burns that are normally associated with Muriatic acid. Use DEFY Safer Brick & Masonry Cleaner to clean both brick and masonry surfaces of rust, mildew, algae, mortar splatter, smoke and creosote stains. It can also be used when acid etching prior to applying floor coatings. DEFY Safer Brick & Masonry Cleaner is a concentrated formula that makes 5 gallons when diluted and is sold in 1 gallon recyclable plastic containers. *Note: Do not use on limestone! DEFY Safer Brick & Masonry Cleaner will dissolve limestone.